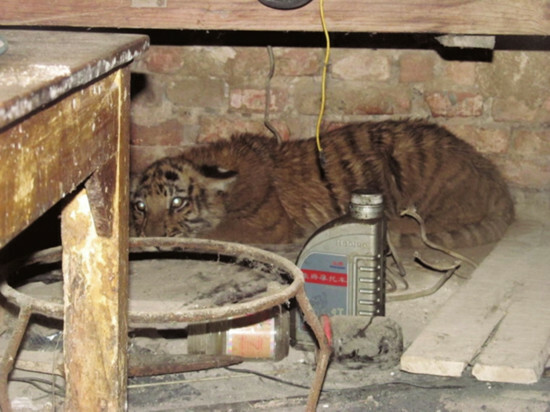 On the early morning of July 5, a tiger cub broke into a resident's kitchen in Anhui Province's Huaibei City, Anhuinews.com reported. Mr Lv said he was woken up by the loud barking of his two dogs at about 5 a.m. that day. He then saw what appeared to be a big cat wandering into his kitchen. Lv immediately got up and followed the animal into the kitchen and -- unsuccessfully -- tried to scare the intruder away. He left it there and went out for work. Lv manages a fish pond at his home, and fishermen come there to make a catch. In the afternoon, one fisherman went into the kitchen to get his fishing gear, but was terrified by the howls of the "big cat". Later, police arrived and identified the animal as a tiger cub. It was then captured and sent to a local zoo. On the early morning of July 5, a tiger cub broke into a resident's kitchen in Anhui Province's Huaibei City, Anhuinews.com reported. It was then captured and sent to a local zoo.